If you're after a casual yet totaly stylish look, dress in a navy and white horizontal striped coat and navy skinny jeans. Both of these items are totally comfy and they also look stunning when worn together. 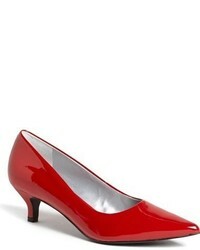 Up the cool of your ensemble by complementing it with Trotters paulina textured pump from Nordstrom. So as you can see, looking stylish doesn't take that much the place of work. Just wear a grey lace sheath dress and you'll look amazing. Look at how well this look pairs with Trotters paulina textured pump from Nordstrom. If you're on the lookout for a casual yet seriously chic look, opt for a black blazer and an orange jumpsuit. As well as super comfy, both of these garments look great paired together. 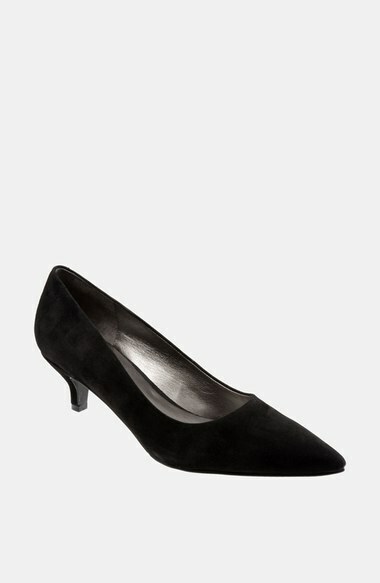 Black suede pumps will add elegance to an otherwise simple look. If you're looking for a casual yet seriously stylish getup, make a tan crew-neck sweater and a tan leopard pencil skirt your outfit choice. Both pieces are totally comfy and they also look great paired together. Sporting a pair of Trotters paulina textured pump is a simple way to add extra flair to your look. For a cool-meets-seriously chic outfit, make a light blue dress shirt and a navy pleated midi skirt your outfit choice — these two pieces play beautifully together. When it comes to shoes, this ensemble pairs well with Trotters paulina textured pump. Try teaming a grey dress shirt with grey dress pants for a stylish and sophisticated look. When it comes to shoes, this ensemble pairs nicely with Trotters paulina textured pump. If you're in search of a casual yet seriously stylish getup, make a black leather biker jacket and black skinny pants your outfit choice. As well as very comfortable, both garments look great together. Bump up the cool of your look by finishing off with Trotters paulina textured pump. If you're hunting for a casual yet absolutely chic look, wear a black cable sweater with black leather skinny pants. As well as totally comfy, these items look great paired together. To add oomph to your outfit, complement with Trotters paulina textured pump. 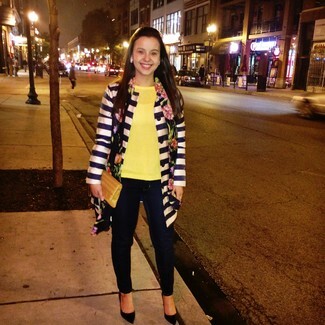 If you're after a casual yet incredibly chic look, rock a mustard cable sweater with navy floral skinny pants. Both items are super comfortable and will look wonderful when paired together. 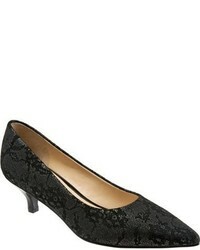 Bump up the cool of your ensemble by completing it with Trotters paulina textured pump from Nordstrom.